During my 10th grade spring break, perhaps one of the most enlightening trips that I took in high school was with my Jack and Jill of America teen group was to the campus of historic Tuskegee University, founded by Hampton Institute (now University) graduate Booker T. Washington in Alabama to “lift the veil of ignorance” from the masses of former slaves. Of the many things that struck me as profound about Tuskegee was that many of the buildings were built by the very former slaves who would later traverse their halls seeking enlightenment. 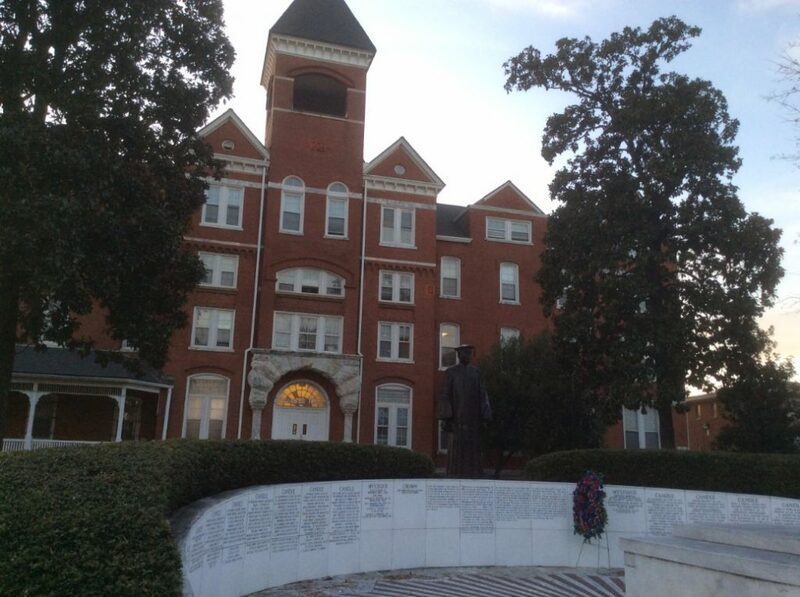 (Statue of Booker Washington and Washington Hall at Tuskegee University below). Indeed, many of Tuskegee’s fellow Historically Black Colleges and Universities (HBCUs) faced similar inauspicious beginnings to become beacons of hope, as they lit the flames of education and activism that soon saw a burgeoning black middle and upper class that, much like the mythological figure Prometheus bringing fire to mortals, brought education to those who previously faced the possibility of certain death for seeking the same. But in the 1930’s, in as much as the Harlem Renaissance from the 1920’s had introduced the nation–if not the world–to the varied talents of many of the black writers, artists and painters of the era, many of whom had attended an HBCU, by the mid-1930’s, these same graduates were struggling like other Americans to make ends meet within their chosen professions. Some, like Lincoln University alumnus Langston Hughes and former Howard University student Zora Neale Hurston had signed on with President Franklin D. Roosevelt’s Works Progress Administration to work as writers and more importantly, as biographers who wrote slave narratives culled from still living former slaves. Under Houston’s leadership, the pair began a series of legal challenges to the Plessy vs Ferguson decision that had established “separate but equal” as the law of the land in 1896. The problem with Plessy was that while most state public institutions were separate, they were far from being equal in terms of funds allocated for buildings, books and teachers. To this end, Houston and Marshall’s first “moral victory” was 1935’s Murray vs Pearson case, one in which the Maryland Supreme Court held that the state was required to fund legal education at the state’s black colleges in Baltimore (Morgan State) and Princess Anne (Maryland State–now Maryland Eastern Shore). The pair would reel off a series of victories in the late 1940’s in the Sweatt v Painter and McLaurin vs Oklahoma State Regents cases, both decided in 1950 and both creating cracks in the separate but equal doctrine. Cognizant that an ideological shift could lead to Plessy being overturned, by 1950, many southern states went on an expansive building spree to modernize schools for black children in hopes of coming closer to the “equal” language of Plessy from a facilities and costs per pupil standpoint. In Florida, many high school buildings at old black high schools in Gainesville, (Lincoln) Tallahassee (FAMU High and “Old” Lincoln), Havana (Havana High), Quincy (Carter-Parramore) and Jacksonville (Old Stanton), had buildings built or modernized that looked and where still standing, still look eerily similar to each other. The Jim Crow South, however, would crawl at a snail’s pace and in sheer defiance of what many considered to be federal meddling, many state legislatures in the south soon voted to place the Confederate Battle Flag as prominent features on the individual state flags. Still, the slow change in public sentiment among the more educated white leaders in Florida soon gave way to the enrollment of UF Law’s first black student, George Starke, who registered in September of 1958. Starke, under constant pressure and death threats, withdrew after only three semesters, thus making W. George Allen, Class of ’62, the first black graduate of UF Law. It would be eight full years, 1970 exactly, before Stephan P. Mickle became the second black to graduate from UF Law. Mickle also holds the distinction of being the first black to graduate as an undergraduate at UF in 1965 and his wife, Evelyn, was the first black to graduate from UF’s Nursing School in 1967. Mickle would later rise to a series of other “firsts” in his home county of Alachua including becoming the first black county judge, then the first black circuit before being named to the District Court of Appeal and finally being tapped as a Federal District Judge. To my fortune, I have had the privilege to practice before Judge Mickle in numerous federal criminal and civil cases during my career. As we will analyze in future lessons, the Brown decision and its progeny, while crucial, would be fought against in earnest for the better part of a decade and a half and more critically, the fight also led to a rise in lynchings, bombings and murders of black and white protesters by hard hearted segregationists.